Diabetes has become the new ‘global epidemic’, with almost 350 million sufferers worldwide. What is the disease? 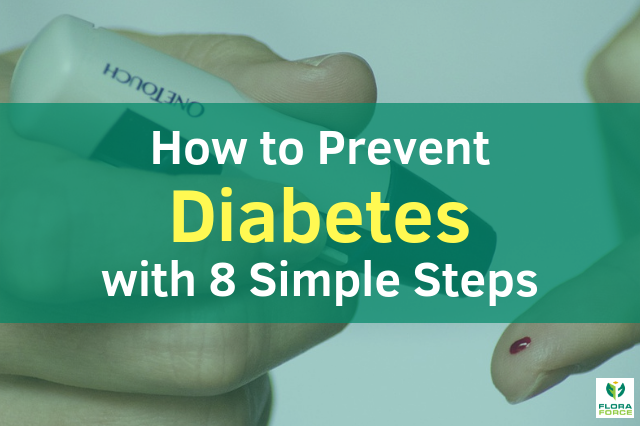 And what can you do to prevent diabetes? The cells in your body depend on the simple sugar, glucose, for most of their energy needs. However, the amount of glucose in the bloodstream should stay within a certain range – it shouldn’t drop too low or climb too high. Most of the digestible carbohydrates you eat are converted into glucose and are rapidly absorbed into the bloodstream. As your glucose level climbs, signals are sent to your pancreas to make and release insulin – a hormone that instructs cells to soak up the glucose they need to create energy. If insulin is not released, the glucose would simply float around in your bloodstream. And that’s when diabetes threatens. There are two types of diabetes. Type 1 diabetes occurs when the immune system attacks and permanently disables the insulin-making cells in the pancreas. This type is usually diagnosed in children and young adults, and was previously known as juvenile or insulin-dependent diabetes. Only 5–10 percent of people with diabetes have this form of the disease. Insulin therapy and other treatments can allow type 1 diabetes sufferers to live long and healthy lives. Type 2 diabetes tends to creep up on people and can take years to develop into full-blown diabetes. Although heredity plays a role in type 2 diabetes, a sedentary lifestyle and excess body fat definite contribute. Too much body fat and a lack of exercise together effectively instruct your cells to ignore signals from insulin to absorb blood sugar. Your body’s response is to release more insulin, in effect trying to force the blood sugar into the cells. If your body can’t keep pace, your blood sugar levels soar. Type 2 diabetes used to be called adult-onset diabetes, since it was almost unheard of in children. But with the rising rates of childhood obesity, it has become more common in young people, especially among certain ethnic groups. At first, there are often no symptoms. As diabetes progresses, however, you could experience constant thirst, frequent urination, severe hunger, weight loss, tiredness, blurred vision and sores that take a long time to heal. In the longer term, diabetes is the leading cause of blindness and kidney failure among adults. It causes mild to severe nerve damage that, coupled with diabetes-related circulation problems, often leads to the loss of a leg or foot. Diabetes significantly increases the risk of heart disease. 1. Keep an eye on your weight. Being overweight increases your chances of developing type 2 diabetes sevenfold; being obese makes you 20 to 40 times more likely to develop diabetes than someone with a healthy weight. Lose seven to 10 percent of your current weight to double your chances to prevent diabetes. 2. Eat more whole grains, fresh vegetables and fresh fruit. >Aim for a low-glycaemic diet, with at least seven servings of fruit a day and three servings of whole grains (brown and wild rice, quinoa, rye and oats), to prevent diabetes. Whole grains retain their nutrient-packed components and fibre, which may reduce your chance of developing diabetes by 40 percent. Studies show that fibre-rich diets improve insulin sensitivity and reduce insulin secretion, which helps prevent diabetes. Whole grains, fish, nuts and seeds also contain substantial amounts of magnesium, which supports insulin activity and assists your body’s use of carbohydrates. Processed meats are a no-go zone, especially hot dogs and bacon. Choose foods with ‘good fats’ such as nuts, good-quality vegetable oils and seeds. Avoid ‘bad’ trans fats – those in many margarines, packaged baked goodies, takeaways and any foods containing ‘partially hydrogenated vegetable oil’. Drinking 750 ml of sugar-laden drinks, even fruit juices, a day increases your chances of type 2 diabetes by 25 percent. Prevent diabetes by drinking black, green and oolong tea, which contain a compound called epigallocatechin gallate, which helps cells to take in insulin (but don’t add sugar to our tea!). Reduce your intake of milk. You’ve heard all the reasons to stop smoking, but here’s another one: smokers are roughly 50 percent more likely to develop diabetes than nonsmokers, and heavy smokers have an even higher risk. 6. Get off your behind and start moving. Working your muscles on a daily basis improves their ability to use insulin and absorb glucose. Help prevent diabetes with a mere 30-minute brisk walk every day – you’ll reduce your risk by 30 percent. And it seems that watching TV is an especially detrimental form of inactivity – every two hours lounging in front of the TV increases your chance of developing diabetes by 20 percent. Take steps to deal with your stress levels: get sufficient good-quality sleep, exercise regularly and take some time for yourself. Consult your healthcare professional if you find that stress is impacting on your health and your ability to function properly. 8. Natural remedies can help. Research shows that cinnamon significantly reduces blood sugar levels and may help prevent diabetes. The Flora Force range of herbal products contains a number of useful remedies to support the body to prevent diabetes – Cinnamon capsules are excellent, as are Liver Flush™, Fenugreek, Cholesterol Aid™ and Bilberry. While we encourage you to play a conscious role in making the most of your health, it is vital to consult your medical professional before embarking on any fitness regime. Efficacy and safety of true Cinnamon (Cinnamomum zeylanicum) as a pharmaceutical agent in diabetes: a systematic review and meta-analysis. Grøntved A., Hu F.B. Television viewing and risk of type 2 diabetes, cardiovascular disease, and all-cause mortality: a meta-analysis. JAMA. 2011; 305:2448–55. Hu F.B., Manson J.E., Stampfer M.J. et al. Diet, lifestyle, and the risk of type 2 diabetes mellitus in women. New England Journal of Medicine. 2001; 345:790–7. Hu F.B., Sigal R.J., Rich-Edwards J.W. et al. Walking compared with vigorous physical activity and risk of type 2 diabetes in women: a prospective study. JAMA. 1999; 282:1433–9. Malik V.S., Popkin B.M., Bray G.A., Després J.P., Willett W.C., Hu F.B. Sugar-sweetened beverages and risk of metabolic syndrome and type 2 diabetes: a meta-analysis. Diabetes Care. 2010;33:2477–83. Palmer J.R., Boggs D.A., Krishnan S., Hu F.B., Singer M., Rosenberg L. Sugar-sweetened beverages and incidence of type 2 diabetes mellitus in African American women. Arch of Intern Med. 2008; 168:1487–1492. Oiginal photo courtesy of TesaPhotography / Pixabay.com; adapted with overlay, text and logo 2018.